It’s often said that you have your whole life to make your first album — but few bands know that better than the Relatives. 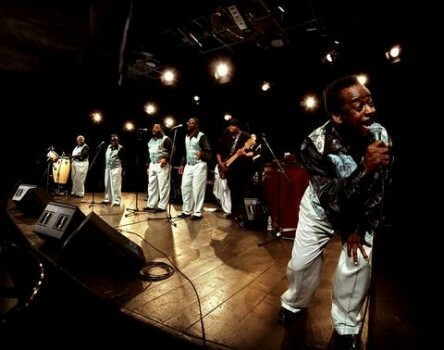 Over four decades after founding the group in Dallas, Texas in 1970, the Relatives will release their debut album, “The Electric Word,” next month. The music veterans’ blend of funk and gospel is powered by the soulful vocals of five singers, showcased in the group’s video for “We Need Love.” The live performance, recorded in founding member Rev. Gean West’s Dallas church, finds the group joined by parishioners who assist with percussion and handclaps. “We Need Love” embraces the group’s softer side, but “The Electric Word” — produced by Spoon’s Jim Eno — lives up to its title, offering guitar work-outs on tracks such as “Things Are Changing.” The Relatives’ return comes after successful performances in recent years from Austin City Limits to Bonnaroo, which the group kicked off after a 2009 rarities album helped listeners rediscover them. “The Electric Word” is due on Yep Roc on Feb. 19. To warm up for the release, the group will play a trio of shows around NYC, starting tonight (Jan. 10) at Lincoln Center. They’ll follow that up with the Bell House on Jan. 13 and Joe’s Pub on Jan. 14. Watch the video for “We Need Love” in the player below. After 40+ years, psychedelic gospel group The Relatives to release debut album ‘The Electric Word’ On Yep Roc. Stream The Relatives THE ELECTRIC WORD exclusively on Texas Monthly. The Relatives featured in The New York Times. The Relatives announce NYC tour dates and new song on Brooklyn Vegan.